McIntosh is without doubt one of the great North American apple varieties. Like its 19th century contemporaries Golden Delicious and Red Delicious, it has become a highly influential apple variety with numerous offspring. However unlike those varieties its popularity has not spread outside North America, and indeed most "Mac" production, remains centred in New England and across the border in Quebec and Ontario. The apple was discovered by a John McIntosh, a farmer in Ontario in the early 19th century, and he and his family became involved in propagating the variety. 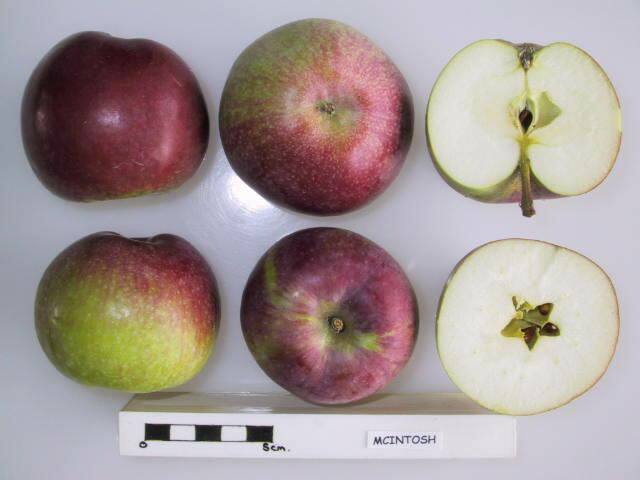 The McIntosh apple was ideally suited to the climate of the area, being a heavy and reliable cropper with good cold hardiness. McIntosh achieves its best flavor in colder apple-growing regions. The McIntosh style is typified by attractive dark red or (more often) crimson colours, and a crunchy bite, often with bright white flesh. The flavor is simple and direct, generally sweet but with refreshing acidity, and usually a hint of wine - often referred to as "vinous". In general these apples keep reasonably well in store, but the flavor falls away quite rapidly - although remaining perfectly pleasant. Nevertheless to get the full vinous sugar rush it is best straight from the tree. These characteristics - the crimson colour, white flesh, and vinous flavour (which fades in storage) - are invariably apparent in its numerous offspring, making this one of the easiest apple styles to identify in taste tests. Indeed McIntosh appears to have very strong genes because its offspring are invariably crimson-colored with bright white flesh, regardless of the nature of the other parent. As a result, telling the offspring apart is a not that easy - the distinctive Mac flavor tends to cut across the characteristics of the other parent. (The one exception is Sunrise, an excellent apple in its own right, but with a very different flavor and a more obvious visual similarity to its other parent, Golden Delicious). Left to right: Fameuse, McIntosh, Cortland, Liberty, Lobo, Spartan, Sunrise. McIntosh remains very popular in the north-eastern USA, and across the border in Ontario and Quebec. However it is probably fair to say that most of its offspring are actually better apples in one way or another. They invariably exhibit "that" flavor, often better than the Mac itself, as well as offering other attributes such as being easier to grow or storing better. However for many Mac enthusiasts only the original will do. A pristine, ripe McIntosh apple straight off the tree is one of the miracles of nature. Visually, this apple is about as good as it gets. The shape and glossy crimson skin with that small white blush is what we imagine a perfect apple should look like. The flavor is outstanding provided you can get them quickly after harvest. To me the taste is a "bright" classic apple flavor, with just the right amount of acidity. The juice has been described as "vinous" in character. I agree, which adds to the pleasure of the eating experience. The pure white flesh is dense with great crunch. Alas, the apple has two faults. First, I've purchased supermarket McIntosh apples that tasted bland and mealy. Second, for all the density of the flesh, it didn't hold up as well as expected in a pie. When sliced it also browns quickly. Cortlands taste similar, but are better for salads and baking. I grew up in central Penna. and with the scent of mcIntosh apple pie and apple dumplings, next door, in my aunt Eleanor's kitchen. The stand-out attribute of this variety in my mind is the distinctive aroma. Quite unlike any other. The fruit, also unlike any other, is extremely delicate; that's why I think most grocers avoid stocking them (the phrase I've heard them called is "smash and toss" apples) They bruise easily then rapidly mush and rot. They are like a beautiful sunset. Awesome and short lived. I'm attempting (with limited success) to grow them here in western Washington state, difficult because it doesn't get cold enough in the winter. I will continue the effort because these are the best apples EVER ! I ditto all comments. I grew up in the 1960's in Wisconsin and have eaten and relished many a Mac and Cortland. They make the best applesauce with the skin on hands down with nothing added. I will add my accolades here and say that the Mac has always been my favorite apple, growing up along Keuka Lake in upstate NY. In fact, I tasted a Mac purchased in a market here in Georgia and was shocked to find that it had that special flavor that I associate with fresh upstate Macs. (The grower turned out to be in eastern Pennsylvania, and so now, if I buy Macs here in Georgia, I'll only buy if they are from that grower). There is nothing like the tart, acidic bite of a fresh Mac, and the other writers are correct; it's great for applesauce when the apple has lost some of its initial crispness. I miss this apple so much that sometimes I have it sent down where I live, special order. I adore this Apple none compares. The sweet & tart taste is in perfect balance, the skin is thin and easy to chew, they are just the right size for eating. Can only find them in Albertsons stores. Just read that shipment from Canada to California or Arizona is outlawed. Not sure how Albertsons gets them. I have seen orchards in the San Bernardino California area in 1998 but our weather has been so strange in California some of the crops I'm making it. I would pay anything / Apple- usually cost $2 each. Worth every penny for the eating pleasure that no other Apple offers in my mind. In the Northeast, you can't beat a fresh-from-the-orchard McIntosh imo. Juicy and delicious! In the supermarkets when they out of season, they can be mushy and less flavorful, and I fall back to varieties like Pink Lady and Jazz. Thinking about a McIntosh for someone who grew up in New York and New England is like trying to thing about breathing; in the 60's and 70's, apple = McIntosh. Not a great keeper by any stretch of the imagination, nor particularly crunchy, but that taste called "vinous" I would call "aromatic" if it hadn't been usurped for the taste of a Red Delicious. But a Mac truly is aromatic, and gets more so for several days of standing at room temperature while it softens. A small room with poor ventilation and a couple of Mac's will have their wonderful smell, like wild grapes in autumn - yes, I guess it is "vinous". In case you can't tell, I still love them! I did a blind test with juice I squeezed from a Mac, a Fameuse, a Macoun and a Liberty. Of the four, the Mac was the most intense, but also the best balanced. (Fameuse and Liberty tied for close second, and Macoun was a distant last place). In southern California it's becoming progressively more difficult to find good Macs. Used to be all the markets carried them but now Albertsons and a few independents are the only places they can be found. A good mcintosh apple is eating pleasure, but availability in southern California is problematic. I am originally from Maine, now living in Minnesota. The Macs here are not as good as those in Northern New England, the flavor is not quite as complex. I love Macs and agree that they lose their crispness as they age. I use Macs and Granny Smith for pies and since my Mother, who loved apple pie was diabetic this combination worked well. With this combo, I reduced the sugar to no white and only 1/4 cup of brown sugar [either light or dark] and it still makes a great pie and one that had very little effect on her blood glucose. I have always found Macs to be good eating right from the tree, but I never pick it to take home because it doesn't keep. This Apple gets soft within a short time and is only best for applesauce. I disagree with the statement that Macs are not good for cooking. It's the technique that you use for baking your pies that determines whether they're runny or not. I never have an issue making pies with Macs or any other fruit, for that matter. Just look online if you want to find out how to keep your pies from being runny with soggy bottom crusts. It's very simple. I live in North East England, and like someone mentioned earlier, in my childhood Macintosh apples were a Christmas treat! To me there is no better apple. I can usually get them near Christmas, presume that is to do with when they harvest. However in 2012 I couldn't find any, this Christmas they were thankfully in the shops again, but I was disappointed as quite a lot of the ones I bought did not have their usual distintive flavour. Hope next Christmas they are back to normal. Mackintosh apples are my absolute favorite and they seem to get harder to find every year. I buy them up in the fall -- as many as I think we can eat. I wish mackintosh were sold in more stores and available for more months of the year. 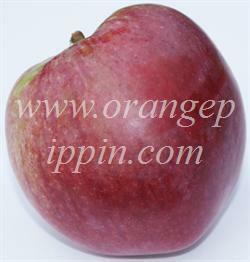 Bo - This apple has classic apple flavor, medium crispness, mildly sweet, very easy to eat. Brent - this is what every apple aspires to be. Crisp, sweet, healthy and not too large. I originate from the NE of England where we used to have them for some reason only at Christmas. For this reason their lovely sweetness is always associated in my mind with this time of the year. I have looked for these apples without success for years and often still eat Spartan and Empire but would love to have the original apple once again. The only Eastern apple I can get in UT. One of my favorites and am glad to at least get this apple in the fall to fulfill my longing for a good apple. McIntosh are my favorite apple. I also have found that other types of apples are often sold as Macs. What a disappointment! I am currently working for an apple grower in western PA and am thrilled to have access to as many McIntosh as I want for the first time in my life! I spent fifteen years living in western Montana, imagine my delight to find that one place McIntosh are grown outside of the northeastern US is the Bitterroot Valley of western Montana! macintosh apples are the best for applesauce. I have tried other apple varieties, however always return to macs. If you don't add extra water the applesauce is not too runny. Also I do not add very much sugar at all. I like the original flavor. I have been canning Macintosh applesauce every Fall for 20 years. These are the best apples in the entire world. I can do amazing things with these apples. For example: My mom makes some amazing applesauce. When I have to fight off zombies, these apple are great for restorting my energy! I find it surprising to see all of the comments about how hard it is to find Macs in the U.K. McIntosh apples are as common as dandelions in Nova Scotia, both the trees and the apples, in stores and farmers' markets. I love them straight off the tree, but what a terrible apple after a few months' storage! They go terribly mushy. I much prefer an Empire or Gala straight out of controlled atmosphere storage. I love this apple. Great for eating whole because it's so soft. Doesn't have the best shelf life though, and because it is a little more tart than I usually like it is my favourite snacking apple. I grew up eating only Macs. My mom's apple pie and applesauce were the best ever, and almost never runny. I'm having a difficult time finding what I consider a true Mac for eating and making Thanksgiving pies. I try to find apples without yellow lines on the skin because those are not what I'm looking for. (They are usually hard, like a red delicious.) Give me a pure green and red skin. I have been comparing PLU numbers to see if that is the key to a good Mac apple. I found some #4154 yesterday that were good. They have only a hint of yellow dotting on them. I'm glad that other people can tell the difference. I'm happy to have found this post - thanks for the information. John McIntosh was my 3xgreat-grandfather, and I want to grow some of his trees for fruit, now that I find myself living in the UK, not Canada. As the climate is very different here, can anyone give me advice, please? See my other post. You are an hour away from Blackpool - and they are in stock now [Oct 20090 ;)) I'd love a tree and cannot find a stockist. Guess what I'm doing with my pips today? I agree - the best but incredibly hard to find. Cildren always love them - even those who 'don't like apples'. However, if you happen to be going to Blackpool (town of mt birth) Abingdon Street market usually sells them. I now live hundreds of miles away and always bring them back when i visit as they seem impossible to find in Suffolk Btw - while you are at the market - buy yourself some crumbly Lancashire cheese and eat them together. A food marriage mad ein heaven!! Tip for British readers: try to prepare this apple like we do in New England, especially if you have children-make it into sauce! If you take care and do not peel the apple while preparing the sauce, it will turn a nice shade of pink, and will convince a finicky child to eat it with her pork chops. I agree with the posters who say that Macs are best eaten early, right off the tree, if possible. I slice and kind of fry them with porkchops and a shake of cinnamon. Yummmmm! Applesauce? Aren't most Canadian commercial apple sauces made from Macs. My mother's homemade apple sauce was perhaps a bit runny, but delicious. I think of all other apples as exotics since I grew up with Macs. The juiciest, most delicious apple there is. Sadly you have to look very hard to find in England as most of the major supermarkets dont sell it - although the hybrid EMPIRE is popular. Independent retailers are the only option. I agree with this description and have loved McIntosh apples for years, but now cannot find them with this flavor and texture. Have they hybridized them for better shipping? Now the apples sold in my area as McIntosh taste completely different! Rated as very resistant - no control needed against CAR.